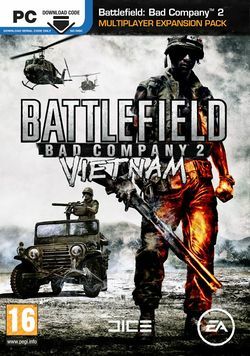 Battlefield: Bad Company 2: Vietnam is an expansion pack for Battlefield: Bad Company 2 which takes the game to the Vietnam era. The core gameplay remains the same, but there have been a few changes to available weapons and vehicles. The game has no single player missions. All the gameplay this expansion pack has to offer is exclusively multiplayer. This page was last edited on 3 July 2012, at 11:00.